Who actually died at the Battle of Crecy? This battle, fought on August 26, 1346, was one of the most important victories for England during the Hundred Years War. New research about the battle has revealed how much confusion existed about who actually died during the battle. 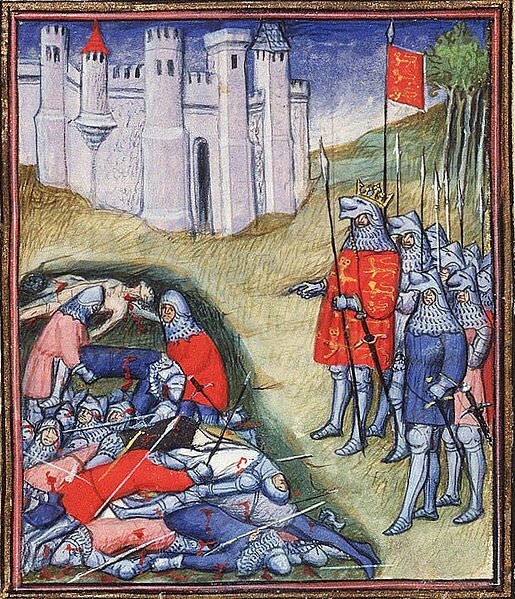 In a paper given last month at the 50th International Congress on Medieval Studies, Michael Livingston detailed his research into over 80 fourteenth-century sources that noted the battle between English and French forces in northern France. He explained that the vast majority of these sources included a listing of who was killed at the battle, usually at the end of the account. Moreover, he found in many of these sources there were numerous errors among these names, with many of the people said to be dead actually surviving. This includes a letter written by King Edward III, sent just days after the battle, where only 50% of the people he identified as dead were really dead. For example, James III, King of Majorca, who took part in the battle on the French side, was reported to be dead, but he actually survived (only to be killed in another battle three years later). Livingston was able to calculate that his various sources, which included Welsh, Italian and Czech chronicles, had together listed 86 separate individuals who were said to have been killed at the Battle of Crecy. Only sixteen of them are known for sure to have died at the battle, with many living on for decades afterwards. Why were there so many inaccuracies in these reports? Livingston notes the importance of a 566-line poem written by Colins de Beaumont, who says he was an eyewitness to the battle and composed the poem just three days afterwards. Livingston calls this source “a versified mortuary role” which lists 29 people who died at Crecy. Moreover, it describes how, in the aftermath of the battle, heralds from both sides collected weapons, shields and armour from the battlefield, hoping that the heraldic symbols on them could be used to identify the dead. These heralds were often in despair as they scoured the battlefield, picking up shattered pieces of shields or broken sword pommels, which they then took a large tent so they could be identified. Livingston finds that under these conditions the heralds would have likely misidentified many of these pieces. Moreover, some of the items found would have been left behind by fleeing men. This would lead to having “so many false positives” for who actually died at Battle of Crecy. The paper given at the International Congress on Medieval Studies is just part of a larger research project by Livingston, who is an Associate Professor of English at The Citadel. With Kelly DeVries, he is preparing a major sourcebook on the Battle of Crecy that will be published later this summer. Next month, he will speaking at the International Medieval Congress at the University of Leeds, giving a paper entitled “The Road to Crecy: Tracing the Path to the Battle”, that will offer new revelations about the battle.